A large part of the Old Rag Mountain Steward program is interacting with people.. from aiding those in need, to helping hikers and climbers understand how fragile the mountain's flora can be (especially when tromping around off-trail), offering wilderness living tips to those who are venturing out overnight for the first time, and being a resource of advanced skills for anyone interested. The result is the same.. a more informed enthusiast for this amazing resource. This past weekend, with a Sunday visitation approaching 2,000 it was good to see our friend and neighbor David C. on one of his frequent trips up the mountain.. And it was also a pleasure to meet a follower of this blog from Richmond VA... and she had a great question... "How do you go about contacting one of the stewards ("the orange shirts") on the mountain if you need them?" On any given weekend on Old Rag during the "busy season" there are usually 4-8 stewards "orange shirts" on the mountain...usually traveling in 2-3 groups. Accompanying each group is an NPS radio, on which all Shenandoah National Park communications traffic is monitored. If you find yourself in need of assistance, head either up or down the mountain, keep your eyes open and ask others where the nearest Old Rag Mountain Steward is... If you are near the bottom, go to the Fee station at either White Oak Canyon or Old Rag (Nethers) and we can be contacted via park communications... Normally, a group of stewards can be readily located between the summit and the Byrds Nest, where we keep our gear. 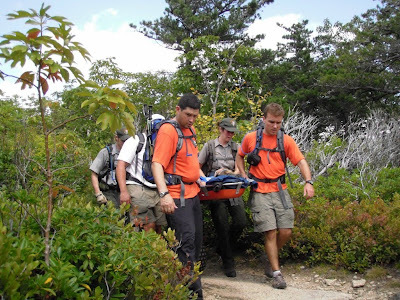 Due to the rugged, and fairly unforgiving nature of Old Rag, ( when something happens, it's too late to learn what to do) a large portion of each weekend's time is spend refreshing basic rescue and first aid skills. You will find even the most experienced stewards participating in this training. The goal is that when the NPS rescue team arrives the ORMS mesh seemlessly with the NPS professionals... a goal we are meeting nicely. "Thank you (Rangers Scully and Martinelli)again for all you did to get me safely off the mountain on Sunday. I am still astonished at the Herculean efforts you and all the others so calmly put forth to rescue me. I can only wonder what would have happened if you had not responded and I had tried in my shock and daze to climb back out. I will be grateful forever. (stewards)Chad and Matt were terrific. I have to say it took a real leap of faith to allow strangers to tote and sometimes haul me by ropes over a rocky mountain on a litter, but my husband and I felt totally reassured by their professional demeanor. Chad was calm, kind, and knowledgeable, and took extra care at the outset of the hauling maneuvers and throughout the journey off the mountain to ensure that everyone understood each step of the drill and didn't rush. His behavior kept me calm and allayed my greatest fear -- that someone else would get hurt in trying to help me. In addition to everything else, Matt made at least two trips that I remember up and down the mountain to locate necessary items. I just can't thank them enough. 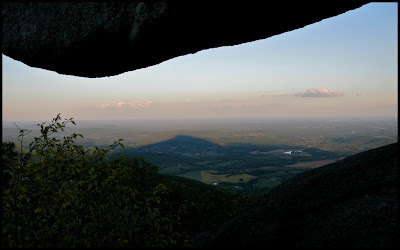 The Old Rag Mountain Stewards is an incredible program. " The low Autumn sun provides a great profile view of Old Rag across Virginia's Piedmont. .. and still more training for the eventual call. As the spring half of the ORMS season draws to a close in the next two weeks, it's nice to have the opportunity to look back on an extremely successful season... so far. First, thanks to the folks at Sport Science, all the mountain stewards are wearing the distinctive orange tee shirts with the ORMS logo.. Thank you Sport Science!!!! The stewards have all spent a lot of really special time on the mountain this spring and have continued to learn a lot about the "specialness" of the place.. Old Rag Mountain. From watching soaring peregrines to training for the (eventual) medical emergency, from learning about the history of "PO Junction" to developing effective techniques of Preventative Search and Rescue (P-SAR). P-SAR is a fascinating concept... and one that is growing in focus across the spectrum of outdoor adventure pursuits, worldwide. Instead of focusing on the reactionary... "OK here is the situation, now what?" P-SAR, instead, encourages folks to look at the environment they are entering and asks them to do a critical evaluation of their mental, physical and material readiness... BEFORE they become over committed to a situation that may be beyond a their abilities or their companion's abilities. All P-SAR really is, is good old fashioned situational awareness and planning... aka "common sense"
- Starting at dusk for a 7 hour hike? "take a headlight/flashlight or two"
- Thunderstorms in the forecast? "take rain gear and don't have your heart set on the summit"
- The weather at 3,200' in Western VA is not the same as it is an hour to the east. Consult a local forecast or better, Shenandoah National Parks website, and plan accordingly. - Hiking in a group of all different ages and fitness levels? Plan on multiple rally points throughout the hike to make sure you have everyone. - Hiking in new shoes? plan for blisters. - Need to go to the bathroom at the start of the hike? How are you going to feel 4 hours from now? prepare! - Is this your first mountain hike ever?? maybe consider working up to this hike..
- It's a hot, humid day, with a strenuous climb.. "if you think you have enough water, then you don't." If more people listened to that one point alone, a lot fewer people would come down the mountain desperate for a drink! Ready for the season ahead..
We had a great training weekend over this past weekend. We took the opportunity to gather all of last years Stewards and the batch of prospective Stewards and conduct a serious amount of baseline medical training. We were pleased to be able to host Bill Kane, from SOLO in NH, (one of the fathers of Wilderness Medicine) as our primary instructor. We focused on patient assessment, and first responder protocols for both single and team rescues. Members of the Shenandoah National Park's emergency response team, rangers and medics, were also able to join us to assist our new members, and refresh the old members with the nuances and procedures for using some of the high speed gear including spine splints and wheeled litters. To train with the gear that we will be using, in conditions similar to those that can be expected on the mountain... if that was our goal, then the weekend was a huge success! Sunday, the weather broke and we were greeted with 60 degree temperatures, sunburns for winter-tender skin, and a chance to feel really ready for the challenges ahead! By the end of the weekend, even the stewards who are the old grizzled pros, who are in the mountains all the time out of both love and vocation, felt like they had added some key tools to their tool kit for keeping Old Rag and its visitors, whole.